Chiiwa Valley (乳岩峡) is located Shinshiro, Aichi. It is about 4km long with pure water and beautiful nature. Especially, Mt. Chiiwa is one of the famous travel spot in Shinshiro. Many people visit here for one day hiking. 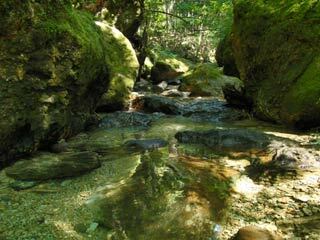 In summer, it offers you fresh air, beautiful green leaves and pure water. One of the best spot for hiking and family activities. Chiiwa Valley is in the Tenryu Okumikawa National Park. It has many huge unique rocks, therefore many free climbers visit here and challenge the cliff.